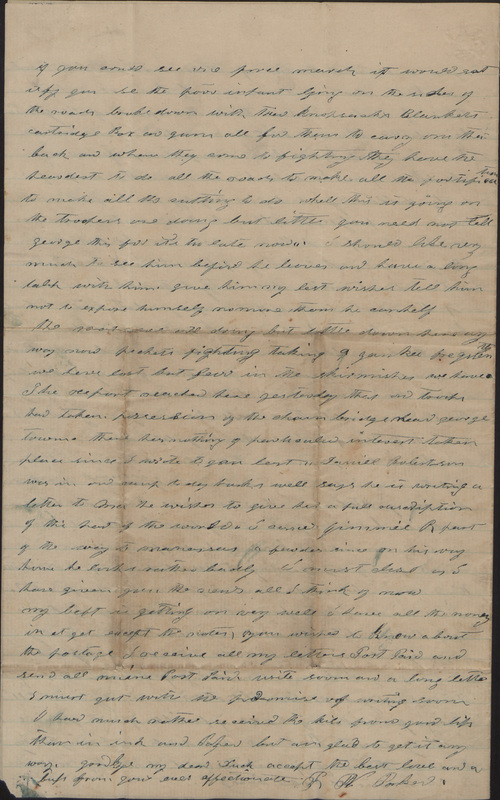 Item description: Letter, 8 September 1861, from Robert W. Parker to his wife Rebecca. He describes camp life, soldiers’ pay, and comments on his provisions for the upcoming autumn and winter. Robert W. Parker was born in 1838 in Pittsylvania County, Va. His father, Ammon H. Parker, and mother, Frances Goggin Parker, eventually settled in Bedford County, Va., where Robert became a farmer. Robert served in the 2nd Virginia Cavalry of the Confederate States of America Army from the onset of the American Civil War, and attained the rank of 4th Sergeant. Robert was killed in action at Appomattox Courthouse, Va., on the morning of 9 April 1865, the same day that Robert E. Lee surrendered his Army of Northern Virginia to the Union Army. Surviving him was his wife, Rebecca Louise Fitzhugh Walker Parker, and two sons. Item citation: From volume 1 in the Robert W. Parker Papers, Southern Historical Collection, The Wilson Library, University of North Carolina at Chapel Hill. I am nearly well as common I had an attack of something like choloramorbus a few nights since which weakened me down considerably but am nearly stout as ever now. and captain is still with us but expects to receive the resignation from the governor at any day it has bin sent to him some time. all our sick I think is improving some J.M garrelle is the worst off he has not recovered his strength from the measles and his boys teas and fret him til he cant rest. They have him read constantly. three of our men left for home a day or two since. Thurner & Luis martin & Samuel Nichols on a sick furlow some of their sickness I think is home sick. I think another will get a furlow to day Whit Vance he will leave on a furlow of expected sickness of his wife. I hope the men of our company who are leaving on account of sickness and other business will return soon and my time will come soon. Well Duck I shall attempt to answer some questions asked in your kind letter. I am very glad to hear you are so fat once in your life. Twould beone of the greatest pleasures for me to see you for I have always wished to see you a big fat woman. you wished to know if I had burnt your letters I kept all of them till a week or so since. when I had a bonfire burnt up all I’ve received from you except the two last and expect to burn them when I get through answering them don’t lie uneasy a bout them for I am as particular with them as you would be with what you please I’ll take care of the letters if they search me. I am not very fraid of the Boys teasing me and if they did little would the difference be. I am glad the prospect is favorable of good luck and hope it may continue so. if the report be true of his saying what he did about his wife he surely hasn’t got good sense for I don’t think any body with good sense woul even think so much more speak it..
you spoke of many people being a fraid their husbands or brothers would be led astray there is no doubt there will be many led far from the pathe they trod when they left home. I thank kind providence that I have taken no bad habits since I left you and have only increased one that the use of tobacco I chew some more than I did when we parted but can quit at any time I think it does me good some times but may be disappointed. nver fear of my yealding to dissipations of a dissipated kind remember my promised to you when we parted I received a letter from Ma yesterday by Rellie Wells he looks tolerable well Ma wrote principally of george leaving I wish he had come and found our company I know something of the hard ships of the infantry soldiers let others do as they wish I’ll always go with my horse if possible if not give me artilery next there are hundreds and I might say thousands that say if ever they reach home they will come in to service on horse back. the… are doing but little down here any way now pickets fighting taking a yankee frequently we have lost but few in the skirmishes we have. The report reached here yesterday that our troops had taken possession of the chain bridge near george town. 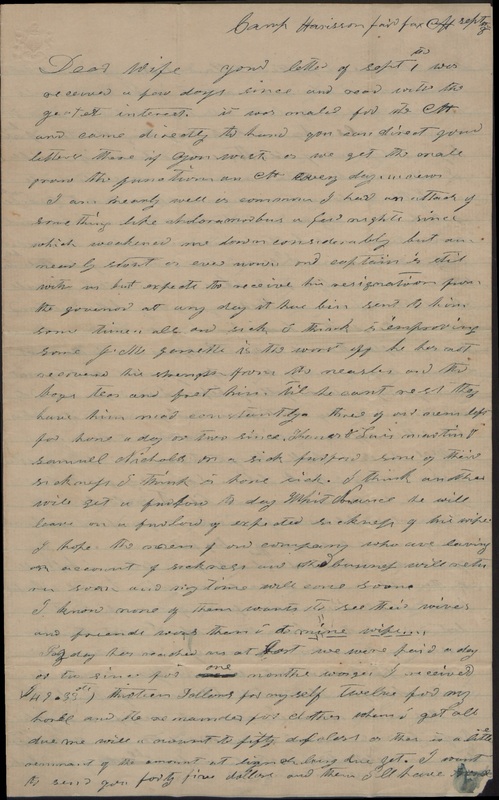 there was nothing of particular interest taken place since I wrote to you last… Daniel Boleston was in our camp to day looks well says he is writing a letter to Ma he wishes to give her a full description of this part of the world. I caried Jimmie R part of the way to Manassas a few days since on his way home he looked rather badly. I must close as I have given you the news all I think of now. This entry was posted in Southern Historical Collection and tagged 2nd Virginia Cavalry, Camp Harrison, Fairfax, Robert Parker, Virginia. Bookmark the permalink.